"Wonderful thick, spicy stew that is so easy to make that you can do it on the busiest of days! Great for a crowd!! No peeking until it's done!!" In a roasting pan, combine the meat, carrots, onions and potatoes. In a separate bowl, combine the sugar, tapioca flour and juice cocktail and mix well. Pour this mixture over the meat and vegetables and cover tightly with foil. Bake in the preheated oven for 5 hours. I, personally, did not care for this stew. It was too spicy for my taste, but friends loved it. 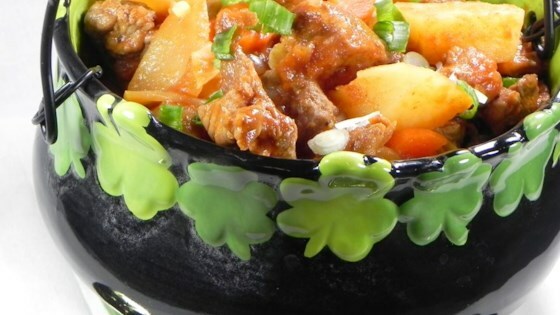 This is a very easy and hearty beef stew and perfect for a warming winter meal. I used regular flour and it came out great. A great basic staple that everyone loves! This turned out great considering I have never cooked before. I made this for my dorm floor, and it was gone in five minutes. Very hearty, add garlic and spices like cayenne pepper to add zest. This recipe is absolutely "FABULOUS". Everyone should want to add this recipe to thier recipe box.